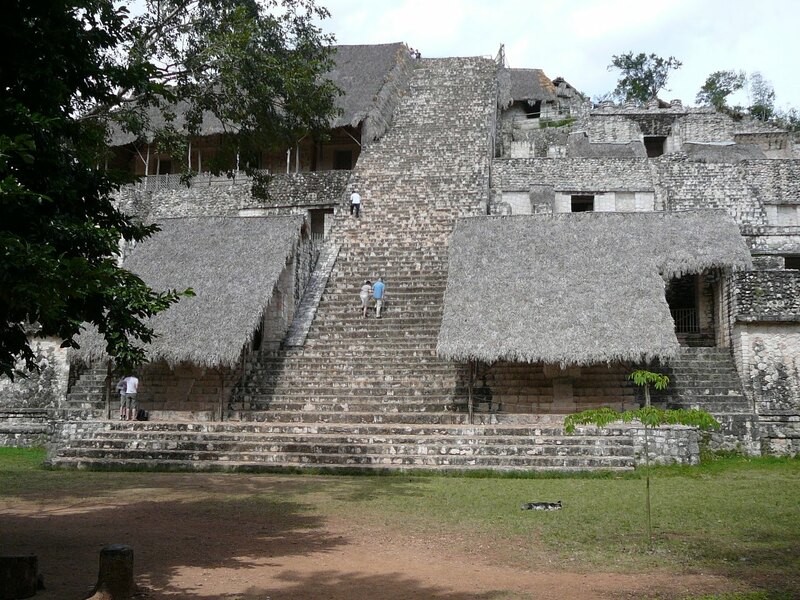 An hour’s drive from Chichen Iza is another Mayan ruin called Ek Balam. It is vaguely on the way to our next stop, Valladolid, and at the last moment we decide to visit it. We are delighted we did. It is our favourite of all the places we visited. In its heyday it was a large Mayan City, but today, although it boasts 45 structures, only a few of them are restored in any way, so it is a small site. It is unusual because it is surrounded by two concentric stone walls plus another one that unites the central buildings. It has a ball court, plus a very beautiful arch where a sacbé (sacred path) ended, which in old times connected the Mayan kingdoms. But what puts Ek Balam on the map, is that it has the largest Mayan building that has ever been discovered. It’s not quite as tall as the temple in Chichen Itza, but its measurements make it the largest building by sheer volume. And this is the first building we have been allowed to climb. Everywhere else has now stopped tourists from climbing the temples, and while we quite understand the necessity for doing this we are disappointed that we haven’t been able to experience them from the top. But here we can, and the view is breathtaking. We even have birds of prey circling below us. What adds to the importance of this building is that there are some unusual and well preserved carvings along with a small amount of original wall paintings. 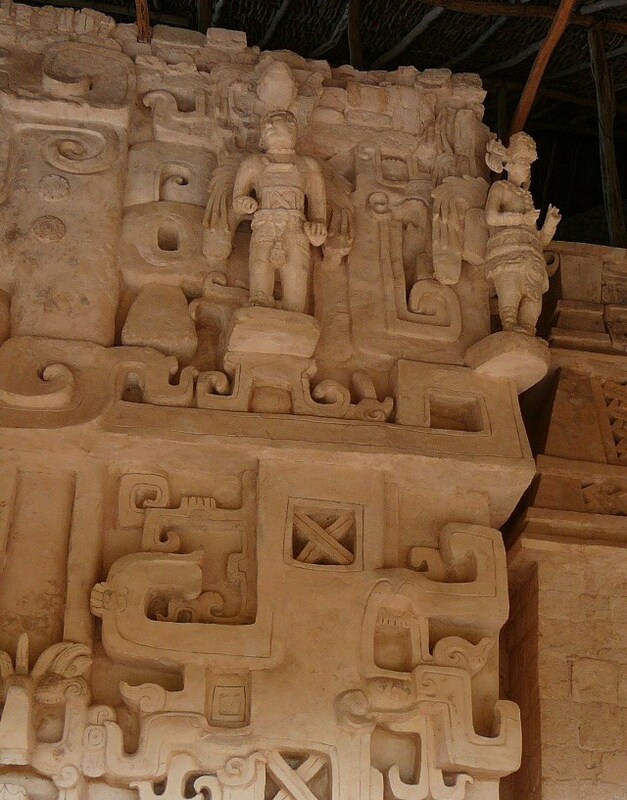 Some of the carvings are unique, depicting Mayans with wings making them look like angels. 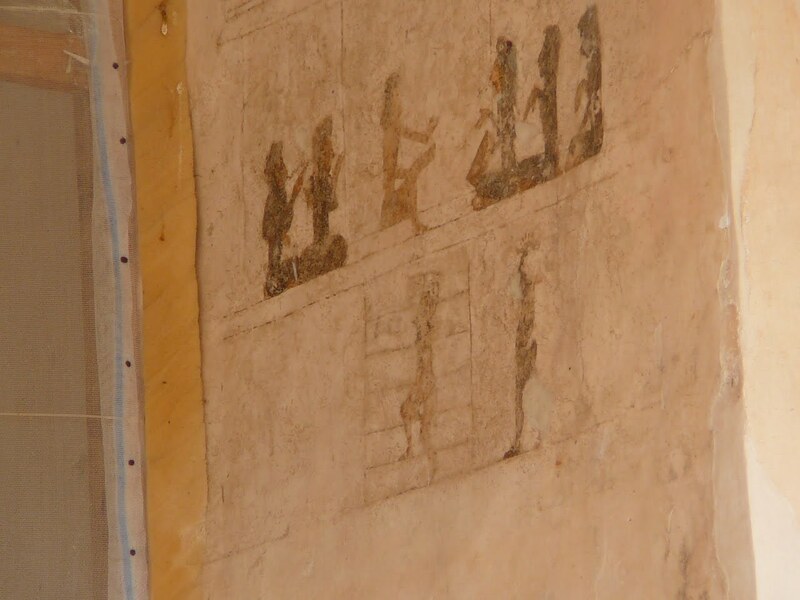 While restoration was taking place they found these carvings and paintings actually hidden underneath an exterior staircase. They had obviously been built over at one point and so they are perfectly preserved and in fact looking at them today they seem new. Even the painting is still brightly coloured. Ek Balam is beautiful with a magical feeling about it. We can actually sense the spirit of a Mayan town while we stand in the middle of the small site admiring the buildings all around. The buildings are set in what appears to be a huge ornamental garden, but which is in fact just the jungle. Some of the undergrowth has been cleared to create patches of lawn and paths to allow access from one building to another. What is left is huge stately old trees and palm trees, with flowering bushes everywhere. 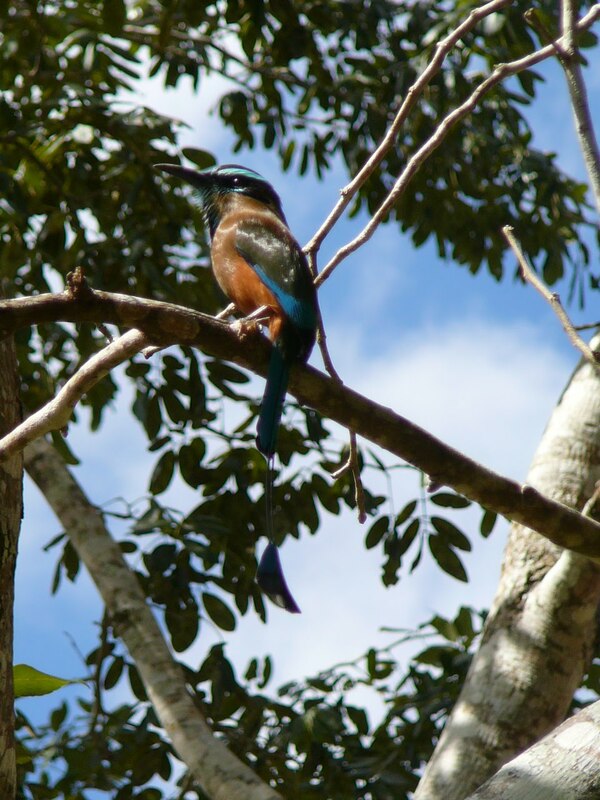 The air is alive with the sounds of birds that swoop from one tree to another. We spent a wonderful two hours at Ek Balam, soaking up the spirit of the place, enjoying the buildings and their wonderful surroundings. It was made even more enjoyable by the fact that the entrance fee was only 31 pesos (less than three dollars). Every Mayan Site we have visited so far has charged the same entrance fee of 72 pesos (Chitchen Itza is a little more), and the woman who owns this site is supposed to charge the same. But the government has stopped helping fund more excavations so she believes as the site is not fully developed, the visitors should not pay full price. This is a wonderful gesture but maybe not the correct one, as it prevents her from making the same amount of money as other sites do, and therefore the government will always ignore her demands.